Ken Densley said his father, who was born in 1929, refuses to let anyone else mow his lawn. On Saturday, the elderly man was working on his yard when he pushed too hard and passed out. According to Densley, neighbors saw what happened and called 911. "He's okay and refused to go to the hospital," Densley said. "My sister and I came as soon as we heard." Densley said as they were taking his dad back inside, he noticed something else. "One of the EMTs put the gurney away and the other finished mowing the lawn!" 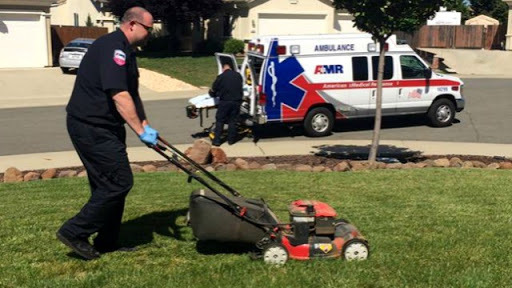 Densley told the EMT mowing the lawn that he would do that, but said the first responder insisted. "He finished and even put the mower away." Densley took a picture of the EMT and shared it on Facebook. The photo has more than 10,000 likes and almost 2,000 shares. Densley said they ended up taking his father, who's about 87-years-old, to the hospital on Saturday. He was discharged on Sunday and "he's doing great."